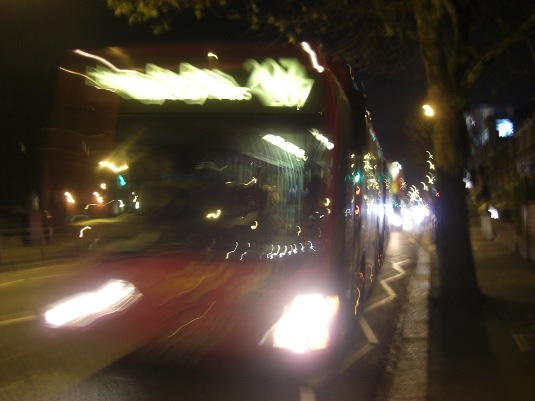 Yesterday (9 December 2011) the bendy-bus (or more accurately the Mercedes-Benz Citaros) was withdrawn from the London 207 route, one of which is pictured above on its last day of service (here’s a less impressionist shot from May 2011). This is the last of the London bus routes to run bendy-buses, which have been withdrawn as a result of the last city mayor election. The size of vehicles. This has been a problem on some of the routes the buses have been used. However they work best on roads that have few sharp bends, such as the 207 route, which I am a familiar – a long, comparatively straight route, with high volumes of passengers that the vehicle is designed to handle efficiently. Fare dodging. This has been an issue – however I’m sure a technical solution could be forthcoming from the organisation that put in place the Tube ticket gating system. Given articulated buses efficient capabilities in dealing with high passenger volumes, and their suitability for disabled users, I don’t believe we have seen the permanent disappearance of such vehicles from London.